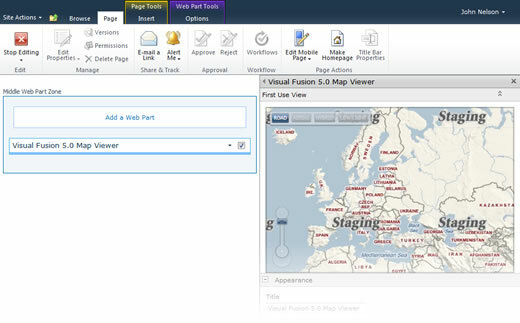 A key attribute of Visual Fusion is it's ability to live inside a SharePoint portal and enable a geospatial dimension to working with and/or creating enterprise data and applications. 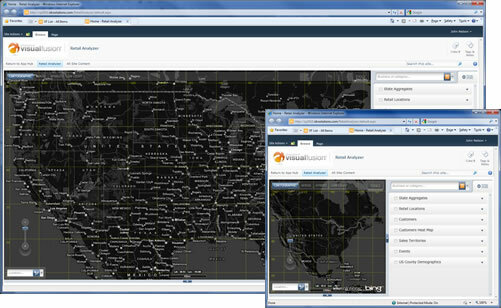 Here are some of the ways that Visual Fusion 5.0 (Fall 2010) continues the geospatial empowerment of SharePoint. If Visual Fusion is installed, each list/library will have an optional tab in the SharePoint 2010 ribbon interface that has Visual Fusion-specific functionality. If the list or library is not geographic or Visual Fusion enabled, you can make it so. And if it is already a Visual Fusion list or library there are a host of cool actions you can take, all in the context of the SharePoint interface. 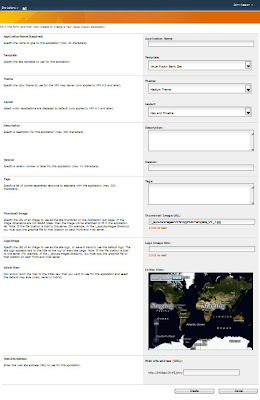 Setting up a SharePoint web part with a VFX component used to require some pretty specific and arcane parameters (like typing in the coordinate bounds for the default map view, and defining the Bing zoom level number) that are much better handled via a helpful little mini-me map that you can position visually. What you see is what you get. Like the web part editor above, setting up a new application using Ap Hub used to require the text input of some pretty specific parameters that are more suited to little map that lets you set those parameters visually and intuitively. Power to the Mini-Me map! Available via the new ribbon interface, you can preview a quick map snapshot of the contents of SharePoint lists and libraries. Visual Fusion apps are more clever consumers of available SharePoint screen real estate than was the case previously. Itty bitty laptop screen? Ok. Ridiculously huge executive monitor? It will stretch to fit. Say goodbye to scroll bars or wasted space! Get all the juicy details in this dedicated post.